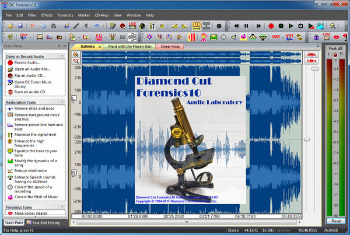 Diamond Cut Forensics Audio Laboratory portable is a comprehensive set of utilities designed for audio restoration, enhancement and audio archiving. This extensive toolkit will allow the user to remove extraneous noise and also enhance the sound from any audio source without degrading the content contained on the original Recognizing that there is a tradeoff between the degree of noise removed from a source and the fidelity transient and frequency response maintained, the developers have sought to provide the highest level of user control while maintaining ease of use over the variables that affect the audio restoration and enhancement process. Professional Audio Engineers, Audio Archivists, Ham Radio Operators, and Audiophile Hobbyists use our productsfor re-mastering, editing, noise removal and audio signal analysis. It is also used by many local, state and federal government agencies including military intelligence operations for forensics law enforcement applications particularly in surveillance situations. Private sector forensics audio engineers use it for post processing forensic recordings of phone calls and surveillance tapes. Radio and television networks have found the LIVE (real-time signal processing) feature of particular value in their real-time applications. Additionally a number of Engineering Colleges and Universities use this software as part of the laboratory portion ofsome coursework pertaining to applied DSP techniques. Auto “Remove Silence” function for easier transcription of long surveillance files. Comparative Histogram allows comparison of statistical distribution of two areas of a file. Set a file Time offset for tracking time in multipart files. Channel phase view to identify edits or track the movement of multiple talkers in a stereo voice recording.